Laparoscopic cholecystectomy (LC) is associated with shorter hospital stay and less pain in comparison with open surgery. The aim of this study was to evaluate the effect of using intraperitoneal hydrocortisone on pain relief following LC. This study aims to evaluate the effect of using intraperitoneal hydrocortisone after LC in decreasing postoperative pain and other adverse effects. Fifty patients were enrolled in a double-blind, randomized clinical trial. Patients (randomly assigned) underwent ordinary LC or along with the operation received 100 mg of hydrocortisone in 250 ml normal saline after extraction of the gallbladder into the peritoneum. Abdominal pain and shoulder pain were evaluated using the visual analog scale after surgery and at 6, 12, and 24 h postoperatively. The patients were also followed for postoperative analgesic requirements, nausea and vomiting, and return of bowel function. Forty-eight patients completed the study. Patients in the hydrocortisone group had significantly lower abdominal pain (10.75 vs. 12.65,P = 0.00) and shoulder pain (5.35 vs. 6.74,P = 0.008) scores than the control group. There were no significant differences regarding analgesic requirements in the recovery room. However, those in the hydrocortisone group required less meperidine than those in the control group (138.55 ± 49.9 vs. 69.96 ± 38.69 mg,P = 0.00). There were no significant differences with respect to return of bowel function, nausea, and vomiting. No adverse reaction was observed in either group. Intraperitoneal administration of hydrocortisone can significantly decrease pain and analgesic requirements after LC with no adverse effects. Laparoscopic cholecystectomy (LC) is the treatment of choice for symptomatic cholelithiasis. Although there are clear benefits compared with open surgery, postoperative pain is still a common complaint after LC . Pain can prolong hospital stay and lead to increased morbidity, which is particularly important in centers performing this operation as a day-case procedure . Different methods have been proposed to relieve postoperative pain following LC . Administration of intraperitoneal local anesthetics alone  or in combination with nonopioid analgesics has been used to reduce postoperative pain following LC. This might reduce adverse effects of opioids . On the contrary, steroids have also been used successfully for postoperative pain relief in different kinds of surgery . The purpose of this study is to assess the effect of using intraperitoneal hydrocortisone to reduce postoperative pain after LC under general anesthesia . The primary outcome is to compare the pain scores. The secondary outcomes included postoperative analgesic requirements, frequency of nausea and vomiting, length of hospital stay . time of return of bowel function, time of unassisted ambulation, and time of oral intake . This study was carried out under ethical approval from local ethics committee of Faculty of Medicine of El Menoufia University. After obtaining informed consent, 50 patients undergoing elective LC were recruited for the study. This was a prospective study that included 50 patients complaining of chronic calculous cholecystitis and undergoing elective LC. The patients were divided into two groups, with 25 patients in each group. Group A is the control group that undergoes ordinary LC in comparison with the group B, the subject of the research. In the patients of group B, we did peritoneal wash with 100 mg of hydrocortisone in 250 ml normal saline after extraction of the gallbladder. Patients who had chronic pain caused by diseases other than gallstone disease; patients on opioids, tranquilizers, steroids, NSAIDs, and alcohol; patients with acute cholecystitis, allergy to corticosteroids, neuromuscular diseases, and bleeding disorders; pregnant patients; and patients with cardiac and pulmonary diseases were excluded. Abdominal ultrasonography and abdominal computed tomography were done in some cases. Complete blood count, prothrombin time and concentration, hepatitis viral profile, alanine aminotransferase, aspartate aminotransferase, alkaline phosphatase enzyme, serum bilirubin (total and direct), serum urea level, and creatinine level were investigated. Laparoscopic instruments used were manufactured by Aesculap Company, Aesculap AG, Am Aesculap Platz, 78532 Tuttlingen, Germany with date of production being 11 May 2012 and the expiration date being 11 May 2018. The patients were supine in position on the operating table. After receiving general anesthesia and sterilization of the abdomen and lower chest by Betadine solution, we inserted the umblical port through subumblical incision and then created the pneumoperitoneum by open technique through the subumblical incision. This port functioned as the camera port. During laparoscopy, intra-abdominal pressure was maintained at 14 mmHg. Additional operating ports were inserted in the subxiphoid area, right subcostal area, and above the level of umbilicus in the anterior axillary line. Patients were put in anti-Trendelenburg position and slightly rotated to the left to expose the fundus of the gallbladder, which is retracted toward the diaphragm. The fundus of the gallbladder was then retracted toward the right iliac fossa to expose Calot triangle. The cystic duct and artery were carefully defined at first. Then the gallbladder was separated from the liver bed for 2 cm to allow for confirmation of the anatomy. The cystic duct and artery were then double clipped and divided. The gallbladder was then removed from its bed by sharp dissection and removed via the umbilical port. Carbon dioxide was carefully evacuated at the end of surgery by manual compression of the abdomen with open trocars. At the end, we inserted subhepatic drain. The drain was kept closed for 2 h and then opened, and the sites of the ports were closed by stitches. Postoperative abdominal pain and shoulder pain were assessed using visual analog scale (VAS) based on a 0–10 scale (with 0 meaning no pain and 10 meaning the most intense pain ever experienced), postoperative analgesic requirements [we used intramuscular meperidine (pethidin) 0.5 mg/kg for VAS 4–7 and 1 mg/kg for VAS 8–10 as rescue analgesic], presence of nausea and vomiting, time of unassisted ambulation, time of oral intake, and time of return of bowel function in the recovery room. Time of return of bowel function was defined as the time from end of anesthesia until the presence of intestinal sound or first passage of flatus. Duration of surgery, bile spillage, difficulty in dissection, intraoperative bleeding, abdominal organs' injury, and the need to do intraoperative cholangiography were the intraoperative points to consider. Postoperative analgesic requirements, postoperative abdominal and shoulder pain, presence of nausea and vomiting, time of unassisted ambulation, time of return of bowel function, and duration of hospital stay were the postoperative points to consider. Arithmetic mean and SD values for different variables were calculated, and statistical analyses were performed for each group. We used independent Student's t-test to compare continuous variables exhibiting normal distribution, and c2-test and Mann–Whitney U-test for noncontinuous variables. P value less than 0.05 was considered significant. Fifty patients were included in the study. However, two were excluded as conversion to open cholecystectomy was necessary in both cases because of dense inflammatory adhesions. The patients were divided into two groups, each group consisting of 24 patients. In all the following tables, group A represents the control group and group B represents the hydrocortisone group. There were no statistically significant differences between the two groups regarding demographic data. The mean age was 46.4 ± 3.6 years in group A and 45.7 ± 3.5 years in group B. The mean weight was 79 ± 8 kg in group A and 77 ± 9 kg in group B. The percentage ratio in group A was 75% female-to-25% male and in group B was 70.2% female-to-29.8% male [Table 1]. There were insignificant differences in the two groups in durations of surgery. The mean duration of surgery in group A was 88 ± 9 min and in group B was 85 ± 13 min (P = 0.879). Factors likely to increase postoperative pain included bile spillage from punctured gallbladder in four patients each from both the groups, with a percentage of 16.66% (P = 0.885), and difficulty in dissection owing to adhesions from previous surgery in three patients in group A, with percentage of 12.5%, and two patients in group B, with percentage of 8.33% (P = 0.721). In all cases, there was no bleeding, need for cholangiography, or injury to bowel or other organs [Table 2]. The abdominal and shoulder pain scores were significantly lower in the hydrocortisone group in the recovery room and at 6, 12, and 24 h postoperatively [total abdominal pain scores 10.75 vs. 12.65 in the hydrocortisone and control group, respectively (P = 0.00); and total shoulder pain scores of 5.35 vs. 6.74 in the hydrocortisone and control group, respectively (P = 0.008)] [Table 3] and [Table 4] [Figure 2] and [Figure 3]. Figure 2: Diagram of postoperative abdominal pain. Figure 3: Diagram of postoperative shoulder pain. There were no significant differences regarding analgesic requirements in the recovery room. Nevertheless, patients in the control group required more meperidine than the hydrocortisone group at 6, 12, and 24 h, postoperatively (151.66 ± 49.9 vs. 69.96 ± 38.69 mg, P = 0.00) [Table 5] [Figure 4]. Figure 4: Diagram of postoperative analgesic requirements. Regarding presence of postoperative nausea and vomiting, length of hospital stay, time of return of bowel function, time of unassisted ambulation, and time of oral intake, there were no significant differences between the two groups. The mean time for unassisted ambulation was 12.6 ± 1.40 h in group A and 12.5 ± 1.45 h in group B (P = 0.735). The mean time of return of bowel function was 18.6 ± 1.5 h in group A and 17.2 ± 1.3 h in group B (P = 0.018). The mean time of oral intake was 11.52 ± 2.2 h in group A and 11.33 ± 2.8 h in group B (P = 0.736). 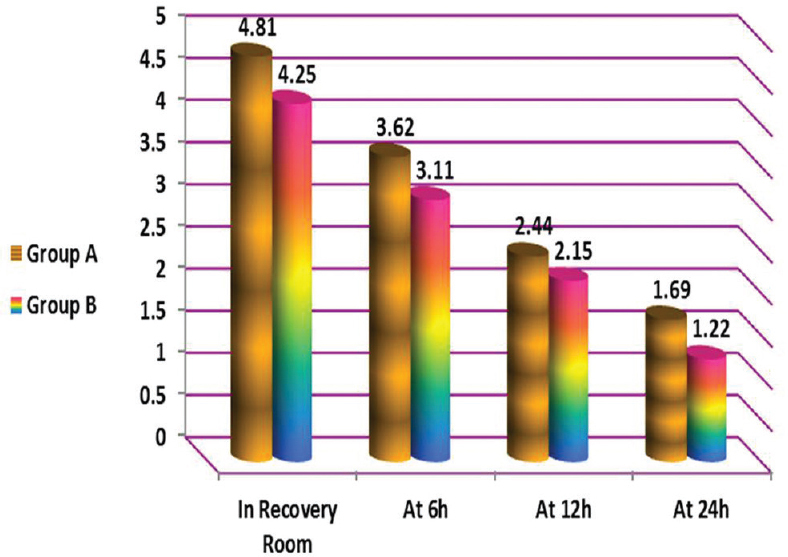 The mean duration of hospital stay was 24.2 ± 3.5 h in group A and 23.5 ± 2.7 h in group B (P = 0.093) [Table 6]. LC is one of the commonest day-case surgeries. The postoperative pain associated with this minimally invasive procedure is generally less intense and lasts a shorter time than that following open cholecystectomy, but it remains a prevalent problem in the early postoperative period and may delay the discharge of the patient, especially in day-case departments . It peaks within the first few hours following the operation but diminishes with time . The origin of pain after LC is multifactorial; therefore, multimodal therapy may be needed to optimize pain relief. After LC, patients complain of pain from the incision of the skin (somatic pain), visceral pain, and shoulder pain from diaphragm stimulation . Incisional pain is defined as superficial pain, wound pain, or pain located in the abdominal wall. Visceral pain is defined as the pain inside the abdomen, which may be deep, dull, and more difficult to localize and may resemble biliary colic. Rapid distension of the peritoneum by carbon dioxide insufflation results in tearing of blood vessels, traction of nerves, and release of inflammatory mediators producing visceral pain; inflammation or local irritation around the gallbladder bed, liver, diaphragm or peritoneum or both, secondary to gallbladder removal and abdominal muscle distension add to tissue injury and produce visceral pain . Shoulder pain is defined as a sensation of pain in the shoulder. The exact mechanism of shoulder pain after laparoscopic surgery still remains unclear. Shoulder pain results from peritoneal insufflation especially when an exaggerated Trendelenburg position is used. Most authors believe it is an irritation of the phrenic nerve, causing referred pain of C4 projected to the shoulder . Because LC has become the treatment of choice for many gallbladder diseases, postoperative analgesia for LC pain has been evaluated in several prospective studies. Pain after LC is less intense and lasts a shorter time, compared with pain after open cholecystectomy. This explains why patients can be discharged within days of LC surgery and can return to their normal daily activities more quickly, compared with open cholecystectomy. However, LC is not a pain-free procedure . Because pain is multifactorial, no consensus has been reached regarding effective postoperative pain relief for patients who have undergone LC. A number of studies have been conducted in an effort to reduce postoperative pain after this surgery, but the results have varied . Postoperative pain control is directed at early mobilization, recovery, and discharge. However, pain can play a major role in metabolic and endocrine responses and can impair postoperative pulmonary function. Various methods have been proposed to control LC postoperative pain such as the use of local anesthesia , intraperitoneal infiltration of local anesthesia , preoperative administration of anti-inflammatory drugs , utilizing carbon dioxide at body temperature, applying intrapleural morphine , and the combined use of NSAIDs and opioids . It has been shown that glucocorticoids can play a crucial role in the regulation of inflammatory responses through both genomic and nongenomic mechanisms, and therefore may reduce pain . Among corticosteroids, dexamethasone has been used widely to reduce postoperative pain. The mechanism of analgesic effect of steroids is not well known . The proposed mechanisms include suppression of tissue levels of bradykinin and the release of neuropeptides from nerve endings; reduction in prostaglandin production, resulting in inhibition of the synthesis of the cyclooxygenase isoform-2 in peripheral tissues and in the central nervous system; and inhibition of other mediators of inflammatory hyperalgesia, for example, tumor necrosis factor-α, interleukin-17β, and interleukin-6 . We demonstrated that intraperitoneal injection of hydrocortisone can reduce pain and analgesic requirements following LC without significant adverse effects. In our research, we used 100 mg hydrocortisone in 250 ml saline for peritoneal wash after extraction of the gallbladder for decreasing postoperative abdominal and shoulder pain following LC. A total of 50 patients complaining of chronic calculous cholecystitis were included in this study. However, two of them were excluded as conversion to open cholecystectomy was necessary because of massive adhesions. The patients were divided to two groups, each consisting of 24 patients. 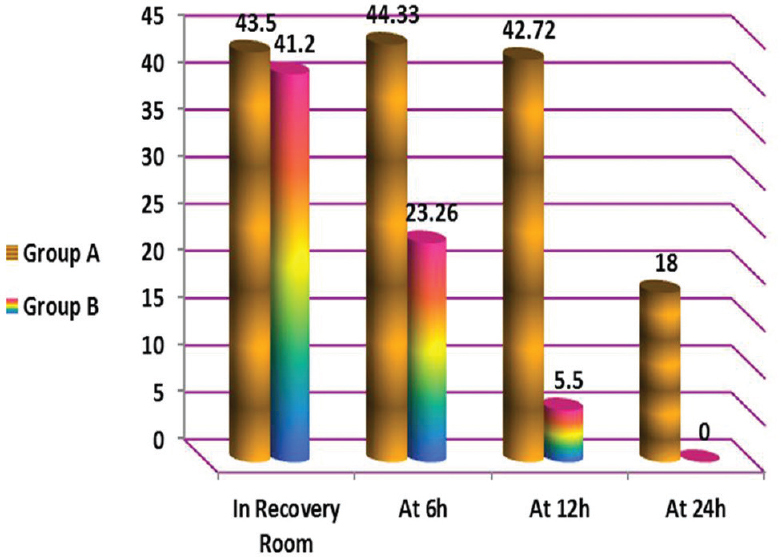 Postoperative shoulder pain and abdominal pain were recorded by VAS, and the dose of analgesic required postoperatively and at 6, 12, and 24 h and also intraoperative and postoperative complications were recorded in the two groups. The results showed that the use of hydrocortisone for peritoneal wash can significantly decrease postoperative shoulder and abdominal pain and also the doses of analgesics required after LC without significant adverse effects or complications. Total abdominal pain scores were 10.75 and 12.65 in the hydrocortisone and control group, respectively (P = 0.00). Total shoulder pain scores were 5.35 and 6.74 in the hydrocortisone and control group, respectively (P = 0.008). Regarding analgesic requirements, there were no significant differences in the recovery room. The mean doses of analgesics were 43.5 mg in control group and 41.2 mg in the hydrocortisone group (P = 0.23). Otherwise, the analgesic requirements had been significantly decreased in hydrocortisone group. The mean dose of analgesics required at 6 h was 44.33 mg in the control group and 23.26 mg in the hydrocortisone group, at 12 h was 42.72 mg in control group and 5.5 mg in the hydrocortisone group, and at 24 h was 18 mg in control group. In hydrocortisone group, the patients did not need analgesics at 24 h after the operation. There were no significant differences regarding durations of surgery or periods of hospital stay. The mean durations of surgery were 85 and 88 min in hydrocortisone group and control group, respectively (P = 0.879). The mean periods of hospital stay were 23.5 h in the hydrocortisone group versus 24.2 h in the control group (P = 0.093). We assumed that early postoperative pain was mainly generated by irritation of the peritoneum, and the application of corticosteroids may attenuate this pain. We used intraperitoneal hydrocortisone successfully to reduce pain following LC. Although meperidine requirement was similar in both groups in the recovery room, patients in the hydrocortisone group required less analgesic afterward. This might be attributed to short analgesic effect of intraoperative remifentanil. The effect of intraperitoneal corticosteroids on pain after elective LC has been investigated by Amene et al. . This research was done on 60 patients and used the same technique as our research. The results of this research was consistent with our research, as total postoperative pain score was 10.95 in hydrocortisone group versus 12.95 in control group. Moreover, the mean dose of analgesic required at recovery room was 41.66 mg in the control group and 40.0 mg in the hydrocortisone group (P = 0.25), at 6 h was 21.66 mg in the control group versus 46.66 mg in the hydrocortisone group, at 12 h was 41.66 mg in the control group versus no requirement in the hydrocortisone group, and at 24 h was 20 mg in the control group versus no requirement in the hydrocortisone. In comparison with our research, we found that the results were approximately the same in the hydrocortisone group regarding pain score (10.95 vs. 10.75 in our research) and postoperative analgesic requirements at recovery room (40.0 vs. 41.2 mg in our research) and at 6 h (21.6 vs. 23.2 mg in our research). The patients needed no analgesics at 12 and 24 h postoperatively. Also there were no significant differences regarding durations of hospital stay or duration of surgery. Amini et al. also compared the effect of preoperative hydrocortisone with bupivacaine on postoperative pain after LC. The results of this research in hydrocortisone group were consistent with our results. This research also had been done on 60 patients. In the hydrocortisone group, total abdominal pain score was 10.98 (10.75 in our research) and total shoulder pain was 5.36 (5.35 in our research). 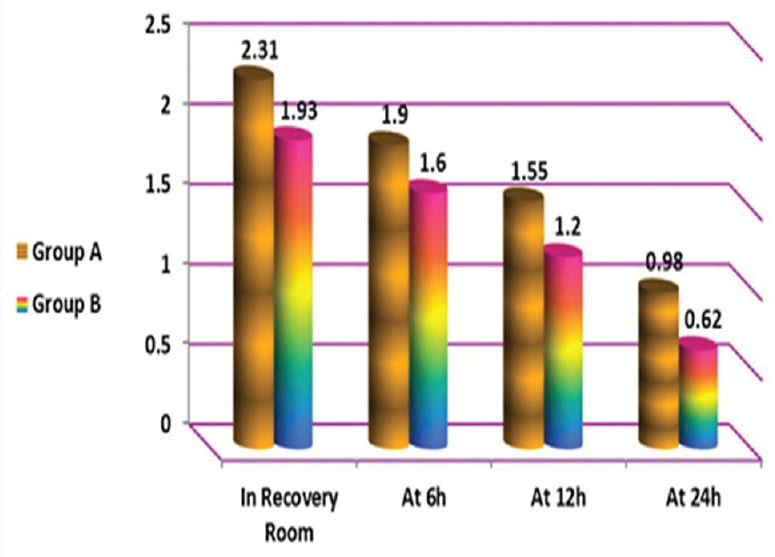 The dose of analgesics at the recovery room postoperatively was 40 mg (41.2 mg in our research) and 21.66 mg at 6 h postoperatively (23.26 mg in our research). The patients needed no analgesics at 12 and 24 h postoperatively. No significant adverse effects appeared after usage of hydrocortisone. In comparison with others methods that aimed to reduce postoperative pain, we found that Aman et al. studied the effect of bupivacaine-soaked gauze in postoperative pain in LC. The results showed that corticosteroids are more effective in reducing pain than bupivacaine. The mean postoperative total abdominal pain score 12.6 versus 10.75 in our research. Mohtadi et al. studied the effect of single-dose administration of intravenous dexamethasone on postoperative pain in patients undergoing LC. This study was done on 61 patients and scored pain at 2, 6, and 12 h only, so the mean total pain score was relatively high in comparison with our research. The results showed that usage of corticosteroids locally in the peritoneum is more effective for reducing pain than its usage through intravenous route. The mean total pain score in patients receiving preoperative dexamethasone was 18.12 versus 10.75 in our research. Total dose of meperidine was significantly decreased than used in our research (44.26 vs. 69.96 mg). This study proved that usage of intraperitoneal corticosteroids can significantly reduce postoperative abdominal pain and shoulder pain in LC and also analgesic requirements without significant adverse effects. El-Labban GM, Hokkam EN, El-Labban MA, Morsy K, Saadl S, Heissam KS. Intraincisional vs intraperitoneal infiltration of local anaesthetic for controlling early post-laparoscopic cholecystectomy pain. J Minim Access Surg 2011; 7:173–177. Boddy AP, Mehta S, Rhodes M. The effect of intraperitoneal local anesthesia in laparoscopic cholecystectomy: a systematic review and meta-analysis. Anesth Analg 2006; 8:682–688. Abdulla S, Eckhardt R, Netter U, Abdulla W. A randomized double-blind, controlled trial on non-opioid analgesics and opioid consumption for postoperative pain relief after laparoscopic cholecystectomy. Acta Anaesthesiol Belg 2012: 63:43–50. Golubović S, Golubović V, Cindrić-Stancin M, Tokmadzic VS. Intraperitoneal analgesia for laparoscopic cholecystectomy: bupivacaine versus bupivacaine with tramadol. Coll Antropol 2009; 33:299–302. Akaraviputh T, Leelouhapong C, Lohsiriwat V, Aroonpruksakul S. Efficacy of perioperative parecoxib injection on postoperative pain relief after laparoscopic cholecystectomy: a prospective, randomized study. World J Gastroenterol 2009; 15:123–185. Safavi M, Honarmand A, Habibabady MR, Baraty S, Aghadavoudi O. Assessing intravenous ketamine and intravenous dexamethasone separately and in combination for early oral intake, vomiting and postoperative pain relief in children following tonsillectomy. Med Arh 2012; 66:111–115. Khan MR, Raza R, Zafar SN, Shamim F, Raza SA, Pal KM, et al. Intraperitoneal lignocaine (lidocaine) versus bupivacaine after laparoscopic cholecystectomy: results of a randomized controlled trial. J Surg Res 2012; 178:662–669. Roberts KJ, Gilmour J, Pande R, Nightingale P, Tan LC, Khan S, et al. Efficacy of intraperitoneal local anaesthetic techniques during laparoscopic cholecystectomy. Surg Endosc 2011; 128:632–691. Choi YS, Shim JK, Song JW, Kim JC, Yoo YC, Kwak YL. Combination of pregabalin and dexamethasone for postoperative pain and functional outcome in patients undergoing lumbar spinal surgery: a randomized placebo-controlled trial. Clin J Pain 2013; 29:9–14. Sultan HM. Complications bile duct stones and its treatment: a randomized placebo-controlled trial. Menoufia Med J 2001; 5:315–316. Inan S, Jaishri B, Sulekha S. The effect of intraperitoneal ropivacaine for post-operative pain management in patients undergoing laparoscopic cholecystectomy: a prospective double-blind randomized control study Open J Anesthesiol 2013; 3:31725–31726. Cha SM, Kang H, Baek CW, Jung YH, Koo GH, Kim BG, et al. Peritrocal and intraperitoneal ropivacaine for laparoscopic cholecystectomy: a prospective, randomized, double-blind controlled trial. J Surg Res 2012; 175:251–258. Maestroni U, Sortini D, Devito C, Pour Morad KB, Anania G, Pavanelli L. A new method of preemptive analgesia in laparoscopic cholecystectomy. Surg Endosc 2002; 16:1336–1340. Salihoglu Z, Yildirim M, Demiroluk S, Kaya G, Karatas A, Ertem M, et al. Evaluation of intravenous paracetamol administration on postoperative pain and recovery characteristics in patients undergoing laparoscopic cholecystectomy. Surg Laparosc Endosc Percutan Tech 2009; 19:321–323. Glinatsis MT, Griffith JP, McMahon MJ. Open versus laparoscopic cholecystectomy: a retrospective comparative study. J Laparoendosc Surg 1992; 2:81–86. Rodriguez AJ, Berde CB, Wiedmaier G, Mercado A, Garcia C, Iglesias V, et al. Comparison of neosaxitoxin versus bupivacaine via port infiltration for postoperative analgesia following laparoscopic cholecystectomy: a randomized, double-blind trial. Reg Anesth Pain Med 2011; 36:103–109. Kahokehr A, Sammour T, Soop M, Hill AG. Intraperitoneal use of local anesthetic in laparoscopic cholecystectomy: systematic review and metaanalysis of randomized controlled trials. J Hepatobiliary Pancreat Sci 2010; 17:637–656. Sarli L, Costi R, Sansebastiano G, Trivelli M, Roncoroni L. Prospective randomized trial of low-pressure pneumoperitoneum for reduction of shoulder-tip pain following laparoscopy. Br J Surg 2000; 87: 1161–1165. Kanwer DB, Kaman L, Nedounsejiane M, Medhi B, Verma GR, Bala I. Comparative study of low pressure versus standard pressure pneumoperitoneum in laparoscopic cholecystectomy – a randomised controlled trial. Trop Gastroenterol 2009; 30:171–174. Joshipura VP, Haribhakti SP, Patel NR, Naik RP, Soni HN, Patel B, et al. A prospective randomized, controlled study comparing low pressure versus high pressure pneumoperitoneum during laparoscopic cholecystectomy. Surg Laparosc Endosc Percutan Tech 2009; 19:234–240. Sun S, Yang K, Gao M, He X, Tian J, Ma B. Three-port versus four-port laparoscopic cholecystectomy: meta-analysis of randomized clinical trials. World J Surg 2009; 33:1904–1908. Lim G, Wang S, Zeng Q, Sung B, Mao J. Spinal glucocorticoid receptors contribute to the development of morphine tolerance in rats. Anesthesiology 2005; 102:832–837. Hong JY, Han SW, Kim WO, Kim EJ, Kil HK. Effect of dexamethasone in combination with caudal analgesia on postoperative pain control in day-case paediatric orchiopexy. Br J Anaesth 2010; 105:506–510. Louizos AA, Hadzilia SJ, Leandros E, Kouroukli IK, Georgiou LG, Bramis JP. Postoperative pain relief after laparoscopic cholecystectomy: A placebo-controlled double-blind randomized trial of preincisional infiltration and intraperitoneal instillation of levobupivacaine 0.25%. Surg Endosc 2005; 19:1503–1506. Amene S, Shahram A, Mohsen K, Reza R, Mohammadi M, Amir H. Intraperitoneal hydrocortisone for pain relief after laparoscopic cholecystectomy. Saudi J Anaesth 2013; 13:150–165. Amini S, Sarvestani AS. Comparing the impact of intraperitoneal hydrocortisone with bupivacaine on postoperative pain after laparoscopic cholecystectomy. Anesth Pain Med. 2014; 4:e17206. Aman A, Salman F, Faisal S, Muhammad ME, Mehmood K. Effect of bupivacaine soaked gauze in postoperative pain relief in laparoscopic cholecystectomy. Patient Saf Surg 2015; 9:131–155. Mohtadi A, Nesioonpour S, Salari A, Akhondzadeh R, Rad BM, Aslani SMM. The effect of single-dose administration of dexamethasone on postoperative pain in patients undergoing laparoscopic cholecystectomy. Anesth Pain Med. 2014; 4:e17872.